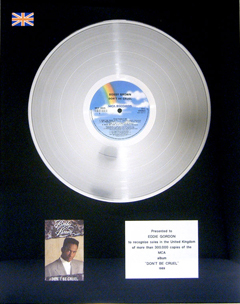 From 1988's Rapacious remix of Bobby Brown's Don't Be Cruel, with Timmy Regisford and Boyd Jarvis in a New York studio next door to the famous Studio 54 Club, there was a period of 10 years intense studio experience which had various personal id's like Egor, AKA, EG's Remix, EDdidit and Eddie Gordon before finding a permanent id of WestEnd after the # 3 National hit "The Love I Lost" with Sybil which locked at # 1 in the UK Club Charts for 5 weeks too. After that there was a big demand for WestEnd remixes and we hit the # 1 spot on the UK Club Charts no less than 13 times in the years that followed. Stand out EG remixes for me in the early days were Bobby Brown's - Don't Be Cruel because it was the first one and MCA Records put my name on the front of the sleeve - they didn't pay me as I was employed by them but the sleeve credit more than made up for that plus being in New York for the first time. Timmy Regisford was instrumental in me joining Motown Records later too. Pete Pritchard, Steve 'Barney' Chase and I did some fabulous work on Eternal's first six hit singles which all went to No:1 in the UK Club Charts and helped the girls sell 4 million copies of their debut album. Lisa Stansfield - All Around The World remix with its Linda Clifford 'Runaway Love' sample really worked a treat as did our work on Lisa's first solo hit "This Is The Right Time". The DOC - Portrait Of A Masterpiece (a Dr Dre production) which we sampled Charles Earland and Teddy Pendergrass on in the studio with CJ Mackintosh. Remixing The Temptations "All I Want From You" for Motown was an honor and it turned out really funky too, once again with my name on the front sleeve. A lucky guy. The Lonnie Liston Smith sessions in PWL studios were incredible highlights with Lonnie playing keyboards over our remake of his classic Expansions - much loved by EG the disco dancer. Check out Wag Ya Tail's - 'Xpand Ya Mind' those keys are the man himself, nearly blind but on fire in the studio with Aadil, Mike and Kevin on vocals - another UK Club No:1 without any trouble. No:1 would be the Millennium mix of The State Of Independence for Donna Summer feat Martin Luther King for the 1996 re-release hit single . Barney and I spent two weeks solid on that remix because we had Quincy Jones's original master tapes from Qwest Studio's. Those tapes included backing vocals from Lionel Richie, Stevie Wonder, Michael Jackson, James Ingram, Dionne Warwick, Michael McDonald and DeBarge. We turned out a classic for one of my all time favorite artists, Donna Summer, she was amazing to work with. Watching her sing our new version on stage at The Royal Albert Hall was a life moment for me personally. No:2 would be Ce Ce Peniston's "Keep On Giving Me Your Love" which was used as the Radio version for BBC Radio 1 and gave Ce Ce another hit record. She was a great artist to work with in the 90's - so talented. No:3 would be Dina Carroll's "Express" as it broke her on Radio and started her solo career with our very funky mix that went straight on the playlist. No:5 would be Donna Summer's "Melody Of Love" which brought her back from the wilderness in the UK Charts before I got to join her label and re-do "I Feel Love" and "State Of Independence" as mentioned before. 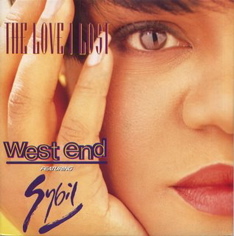 I also need to give a mention to the 13 Minute Dub version of Westend feat Sybil - The Love I Lost, re-titled The Love I Dub. We created 6 mixes for that and then re-edited the best parts from all six into one mix that rocked the Ministry Of Sound dance floor for months being played by the best USA and UK House DJ's on that great MOS sound system. When you are on the dancefloor enjoying yourself then the DJ drops one of your remixes into his set its an incredible feeling -you want to shout "that's mine" but you have to keep it cool and just watch the floor grooving to something that you know every beat and sound of. 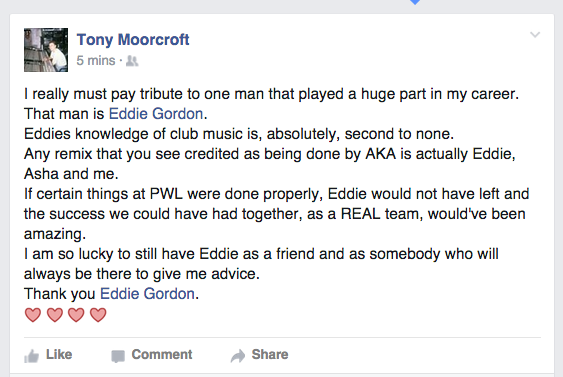 I have a lot of people to thank for my EG/Westend remix career and they include Adrian Sykes, Bob Fisher, Timy Regisford, Boyd Jarvis, Denis Ingoldsby, Peter Pritchard, Steve ' Barney' Chase, Peter Oxendale, Steve Wolf, Nigel Lowis, Paul Witts, John Trott, Penny (Townhouse), Lola (Sarm West), Greg Castell, Richard Marshall, Tony Cook and Asher (we changed the sound of the famous PWL Studios with that Sybil record), Tilly Rutherford, Les Sharma, Pete Day, Pete Waterman, Phil France RIP, Aadil Rasheed, Paul Kindred, Charvonne (Olympic), C&C Music Factory, Tony Humphries, CJ Mac, David Morales, Frankie Knuckles and Todd Terry for the benchmarks, all the artists and backing singers who came back into the studio to re-sing their songs in different keys so we could weave our Westend magic for them. Thank you David Cole (RIP) for the inspiration - you were the man who lit up New York, the quality of dance music from that city changed forever after you left us such was your pedigree. A Deeper Love A Deeper Deeper Love - PRIDE. You were a true genius. LUST Music of the Future XS Rhythm A&R, Remixing, Promotion Promotional 12"
Lance Ellington Lonely 'Have We Lost Our Love' RCA Remixing, Promotion Promotional 12"
Simone Angel Walk On Water AM:PM Remixing, Promotion Promotional 12"
Cardiac Swing D' Yer Mak' Er BMG Eurodisc A&R, Remixing, Promotion Promotional 12"
Rodeo Jones Surrender A&M Remixing, Promotion Promotional 12"
Teena Marie I Need Your Loving Motown Remixing, Promotion DMC DJ 12"